Happy New Year to all of our faithful Block Party Studios followers! Our goal here at Block Party Studios is to meet and surpass all of your expectations with nothing but the highest quality products teamed with unbeatable customer service. Thank you for giving us this golden opportunity! 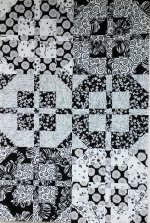 It's January.....don't forget to sign up for this years Block of the Month! 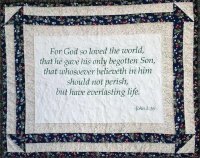 We have a new pattern for our "John 3:16" panel & we're giving it to you for FREE!! Look how cute this place mat is! 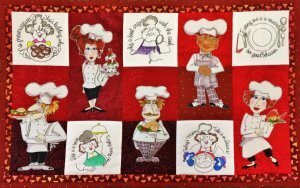 We used our "Food For Thought" panel with Loralie's "Tossed Chefs". It's sure to be a conversation starter at your table! 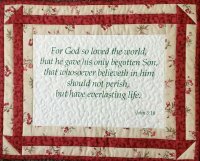 Purchase both panels on our website or stop in to see our sample! 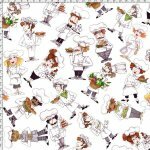 We now have our "Retirement Lane" pattern in stock and it will make a great gift for that soon-to-be-retired friend! Suitable for either man or woman. 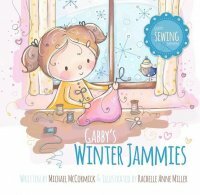 Also new for those future quilters in your family, "Gabby Quilts For friends" & "Gabby's Winter Jammies". 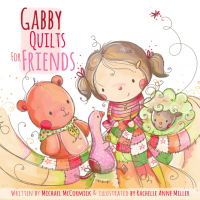 Each book has an important message great for our little ones & contains a pattern, just like Gabby's! Retail price is $9.95. As we gear up for a new year here at Block Party Studios, we look forward to seeing you all again at shows, market, shops or right here in our own show room. Until then, keep stitch'n on! 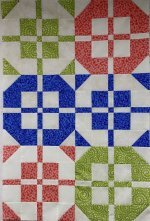 Our next one is the Oklahoma City Winter Quilt Show Jan. 7-9. If you're in the area, we hope to see you there! Also, get a coupon for the entrance fee on our facebook page. AKA the Block Party Studios Family!